The Widmer RS-S High Speed Check Signer RS-S saves time and money. Widmer RS-S High Speed Check Signer is High-Speed, Cut-Sheet Signer with one signature. The reliable RS is designed with flexibility to automatically feed and print large volume runs or the smallest quantities of imprinting. 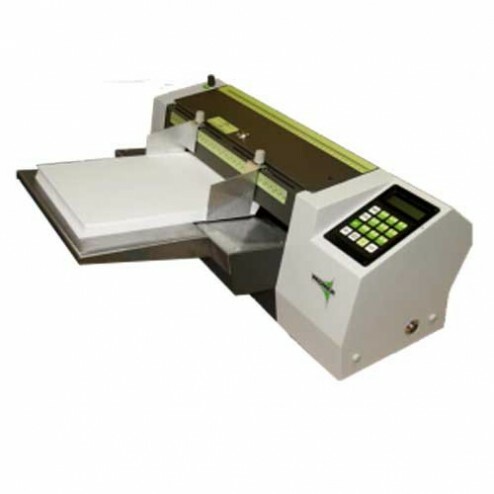 It features digitally programming of document size for assured accuracy. Operators can pre-program up to 9 different jobs. The RS remembers the last program used, even after stopping. User-friendly display prompts guide you through each format. Adjustable guides let you position any imprint to within a 15 ?" X 16" area. The RS can print from 180 to 200 imprints a minute on paper size from 2 7/8" X 2 7/8" to 12 ?" X 14". A Posi-Flow hopper bin with bottom feed keeps documents running smoothly, and in order. An adjustable stripper knob eliminates the feeding of more than one document at a time through the RS. Maximum Paper Size: 15 ?" X 16"